It is almost exactly twenty years since the once clearly defined boundary between versatile estate car and extreme sports car was blurred by the Audi Avant RS2, so the trailblazer for a high-performance breed which continues to flourish is being commemorated by the new RS 4 Avant Nogaro selection. The new special edition will make its debut at the Geneva Motor Show with Nogaro blue paint finish and exclusive equipment. The customised Nogaro blue, pearl effect paint finish is the most immediately apparent tribute to the esteemed RS2 in the anniversary model. In addition, the frame of the Singleframe grille and the window surrounds are painted high-gloss black, and the roof rails matt black. The RS sports exhaust system terminates in two oval, high-gloss black tailpipe trims. Under the bonnet of the Audi RS 4 Avant Nogaro selection sits a high-revving V8 naturally aspirated engine with a displacement of 4,163 cc. The 4.2 FSI delivers 450PS of power at 8,250 rpm, with peak torque of 430 Nm (317.15 lb-ft) available between 4,000 and 6,000 rpm. The resonant eight-cylinder engine powers the anniversary model from 0 to 62mph in 4.7 seconds and takes it to a governed top speed of 174mph. Its combined fuel economy is 26.4mpg – for a CO2 equivalent of 249 grams per kilometre. The core of the quattro permanent all-wheel drive is the self-locking crown gear centre differential. The compact and lightweight component distributes torque at a default ratio of 40:60 between the front and rear axles. This ratio can be broadly varied as required – with up to 70 per cent of the power going to the front and a maximum of 85 per cent to the rear. The crown gear centre differential cooperates with the wheel-selective torque control, which makes handling at cornering limits even more dynamic through selective, small brake impulses. At the rear, the standard sport differential also actively distributes the power between the rear wheels. 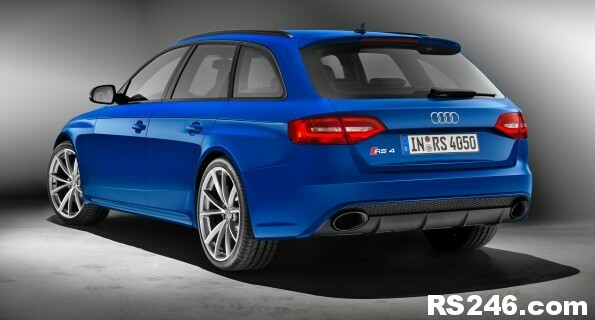 The Audi RS 4 Avant Nogaro selection rides on 265/30 series tyres. Behind the gloss turned finish 20-inch wheels in 5-V-spoke design gleam red-painted brake calipers bearing RS emblems. The brake discs featuring a wave design are internally ventilated, perforated and joined to the aluminium brake disc chambers by pins. Carbon-fibre-ceramic front discs are available at extra cost. The Electronic Stabilisation Control (ESC) offers a sport mode and can also be entirely deactivated as required. In the purposefully styled interior, Audi offers two different upholstery versions for the electrically adjustable S sport seats with their integrated head restraints. 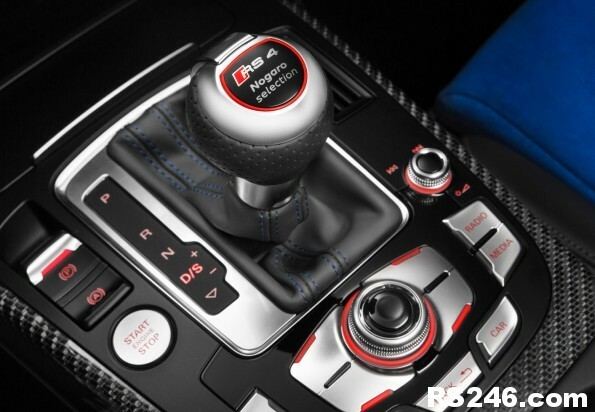 In both cases, the side sections are covered with black Valcona leather; the Alcantara trim for the centre sections and door trim inserts are coloured either black as well or Nogaro blue – in homage again to the Audi Avant RS2. The armrests are covered with black leather, with blue contrasting stitching providing accents. Black or Nogaro blue piping frames the black floor mats. Black leather with blue stitching also refines the steering wheel rim and the selector lever boot. Blue threads run through the carbon inlays. A badge on the RS selector lever knob of the S tronic and the logos on the door sill trims refer to the special status of the anniversary model. 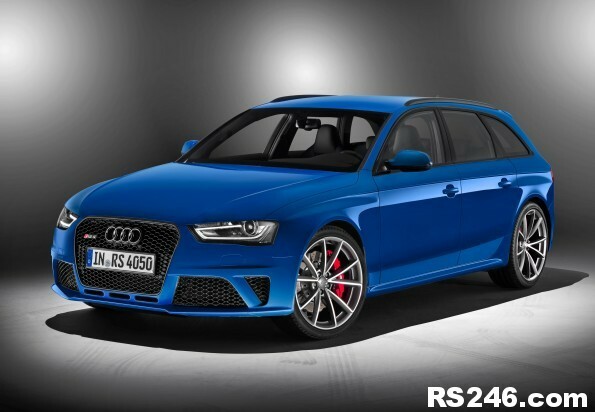 The Audi RS 4 Avant Nogaro selection will be available in mainland Europe later in 2014 as a limited edition. The possibility of UK specification production is still under discussion. The Audi RS2 of 1994 was the first RS model from Audi and also the first high-performance model from the brand to combine full everyday suitability with a dynamic character, becoming the founder of a whole family of performance-focused models. Audi developed the RS2 in conjunction with Porsche, with assembly taking place at Stuttgart-Zuffenhausen. Its appearance alone was indicative of the power of the first RS model. The front bumper featured powerful air inlets, and the grille was painted black. The exterior mirrors came from Porsche, the rear was embellished by a full-width band of light, and the emblems were large-sized. The RS2 optionally left the assembly line with an exclusive Nogaro blue paint finish, recalling the two victories achieved by Frank Biela on the Nogaro circuit in the French Touring Car Championship of 1993. The engine drew on Audi’s extensive experience in touring car racing. The 2.2-litre five-cylinder engine delivered 315PS by way of a large turbocharger, high boost pressure, expanded air ducting and adapted engine management. At 3,000 rpm 410 Nm (302.40 lb-ft) of torque was available, with the limiter only taking effect at 7,200 rpm. 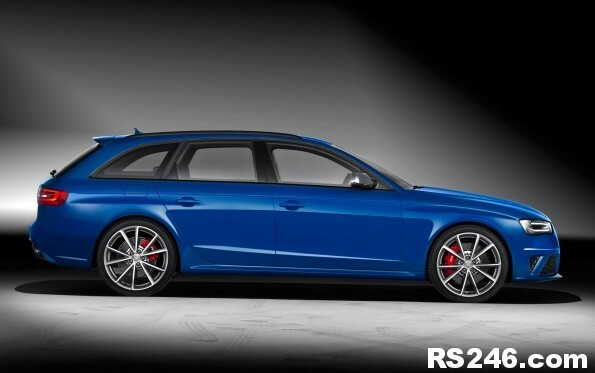 The RS2 accelerated from 0 to 62mph in 5.4 seconds and reached a top speed of 162mph. A six-speed manual transmission delivered the power to the quattro drivetrain, which had a manually activated locking differential at the rear axle. The suspension with its all-round transverse links was derived from the set-up of the performance car which laid the foundations, the Audi S2. The shock absorbers were even firmer and the springs were shortened. Porsche supplied the 17-inch wheels, the large, internally ventilated brake discs and the red-painted four-piston calipers. The interior was dominated by Silk Nappa leather and Alcantara in the colour anthracite, blue or silver grey, and the Recaro seats were electrically adjustable. The instruments bore white dials, while small indicators on the centre console kept the driver informed about the oil pressure, oil temperature and vehicle system voltage. CFRP inlays were optionally available. Audi offered the RS2 at a base price of £39,500 in the UK. Within a construction period of barely two years 2,908 units were produced – more than the quantity originally planned.